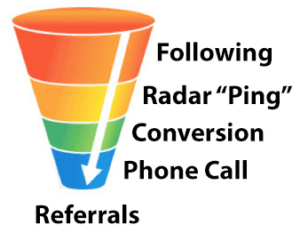 Most salespeople know what a sales funnel is and how it works. For those outside of sales who don’t, the sales funnel details to the buying process that salespeople and companies lead potential buyers through when selling their products and/or services. We can use the same concept of the sales funnel in social selling, but for a different purpose: to leverage content and engagement with prospects, so you can get them to the close faster and more efficiently. Each step here refers to the quantity and depth of your social engagement. There are two key factors in play here; the first is listening. A lot of what you’ll be doing in this funnel depends on what your contacts at the companies you’re trying to get into are saying in social. So you’ll need to “listen” to what they say through their social channels. Because they’re being social, though, this job is easier than you think. The other factor is adding value. As a LinkedIn and social selling trainer and coach, I always emphasize that you should add value and show the value you bring to potential clients in everything you do. Same goes here. When you engage with your prospects, always provide value. Well, almost always; you can’t really do that in the first step below, but you’ll have chances to do so in the rest of them. A great aspect about using the Engagement Funnel is that it can work with your 1st-, 2nd-, and 3+-degree connections. Let’s start off by building the number of people who are at the top of it with this first step. In the top box that contains their photo and headline, find the “More” button and click on it. Mouse down to “Follow” and click on it. At this point you’re not a connection of theirs; you’re merely “following” their LinkedIn shares. In the process you’ve also generated two “radar pings” on their side: The first happened when you clicked through to their profile, as your name showed up in their “Who’s Viewed Your Profile” section (assuming you’ve got your settings to display your name). The second occurred when you started following them, as your “follow” action showed up in their Notifications feed. You can use Following for not only the primary people you want to speak with at a company, but with other potential influencers with that organization as well. Remember that CEB found an average of 6.8 people are typically involved in the B2B purchase process. It’s likely that in the companies you’re prospecting, this group of people fall somewhere within your LinkedIn connections list. Why not make yourself known to this group in your prospect companies? You can then start pinging on their radar by following the next step. Radar pinging. So far, you’ve generated those two “radar pings.” Now it’s time to sustain that momentum by continuing to generate those pings, and the easiest way to do this is to “like” a share or a tweet of theirs. Depending on your sales cycle, you’ll want to do this once or twice a week for a couple of weeks. As you like each share, they’ll be informed that you’ve taken that action in their Notifications feed. By doing this consistently (yet not too much), you’ll become either at or near top-of-mind with them. 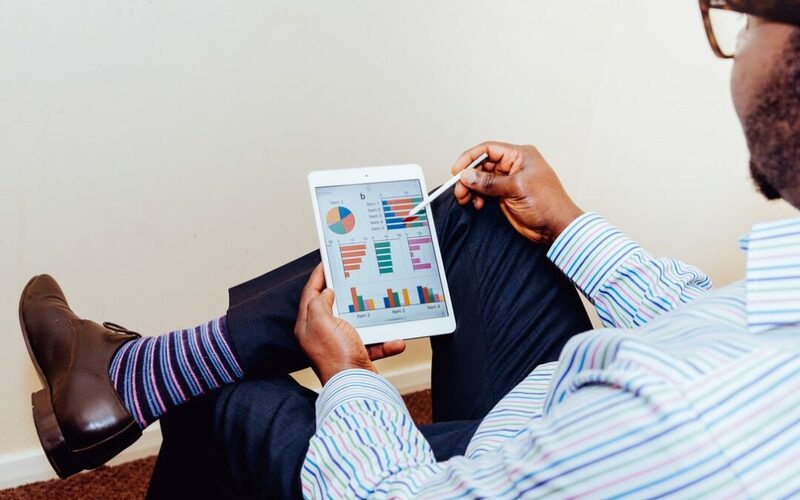 While the ultimate goal is to get them to click through to your profile (and hopefully connect with you), the pinging process is very beneficial for you in building a thought-leadership position with her or him. You can also share their content with your audience, but do so by using one of the three points in the above list. A “Great article!” share just doesn’t cut it here, especially because you lose out on adding your own value to the share. [NAME]: I’ve been following you and your content for a couple of weeks now. I especially liked your share/article on [TOPIC], and thought we could benefit one another by connecting here on LinkedIn. Thanks. You’ll have a higher chance of getting your request accepted through a combination of being known to them, and referencing that in your connection request. You’ll also stand out even further in their mind when you customize your request, as so few people do that when they ask for a connection. Phone Call (or Meeting). Now that you’ve built some presence with your prospect, it’s time to take the online conversation offline. After you’ve connected and when you feel comfortable in doing so, ask for the phone call or meeting. One of the major goals of social selling is to generate sales conversations. Through all of your efforts with the Engagement Funnel, you’ll have a much-higher chance of getting that offline conversation. Before I get to the final stage, I want you to keep one other idea in mind as a “never do” kind of thing. It’s easy to fall into the trap of liking, commenting and/or sharing every single thing a prospect does in social. Along those same lines, it’s very painless to like, comment and/or share many times. When you do either one (or both! ), though, it’ll likely become painful to your bottom line. In short, you don’t want to be a stalker. Do you do business with people who are watching you every move, waiting to pounce on any action you take in social? Didn’t think so. You shouldn’t do to others what you don’t like being done to you. There’s no quicker way to sink a deal than to get all stalker-y on someone. And now, the final stage: Referrals. Once you’ve closed the deal, your contact(s) at your new client company should be stark raving fans of yours. Now’s the perfect time to dig into their LinkedIn connections and see to whom you’d like to get introduced (second-degree connections). Come up with three to five people. Then… ask your contact(s) for referrals. If you don’t ask, you’ll never get one. Here’s hoping that your effective use of the Engagement Funnel helps you to close more deals in a faster and more efficient way. Want to learn more? Schedule a call with me!